16.1 (a) The Secretary of the Senate shall provide a reasonable number of spaces on the Senate floor and in the Senate gallery for individuals and organizations with credentials and passes issued under this rule. (b) The Sergeant at Arms may not issue credentials or day passes under this rule to political organizations or to individuals affiliated with a political organization. For the purposes of this rule, "political organization" means an organization owned or controlled by a registered lobbyist, a political caucus, a political party, or any party organization and "individuals affiliated with a political organization" means an individual who, during the preceding 24 months, has been employed by or received any compensation from a political organization. (c) Due to the limited space available for organizations or individuals providing news coverage of the Senate, the Senate finds that there is a compelling public interest in limiting credentials issued under this rule to organizations or individuals who demonstrate that they provide regular news coverage of the legislature. For session credentials, an organization or individual must submit an application to the Sergeant at Arms. The Sergeant at Arms must review the application and approve or reject it within 14 days after receipt. Upon the request of the Sergeant at Arms, an applicant for credentials must provide evidence of the applicant's activities in providing regular news coverage of the legislature. Evidence of regular news coverage must include examples of news coverage of legislative matters produced by the applicant. The examples must include written, video, or audio coverage written or recorded in the past year, and a description of how they were publicly distributed. Any opinion expressed in the examples is not subject to review under this rule at any time. (d) If an application is rejected, the Sergeant at Arms must state the reason for the rejection in writing and notify the applicant, the Secretary of the Senate, the Majority Leader, and the Minority Leader in writing. (e) An appeal of a denial of credentials must be made in writing to the Secretary of the Senate, the Senate Majority Leader, and the Senate Minority Leader. The Committee on Rules and Administration shall review and decide the appeal within 14 days after receiving a letter of appeal. 16.2 The Sergeant at Arms may grant a day pass for access authorized under Rule 16.1, paragraph (a) The day pass may be issued for a single day to an individual or organization who has not applied for credentials and who is not prohibited from receiving credentials under Rule 16.1, paragraph (b). The pass may be granted upon the request of a member or the organization or individual, and may be renewed from day to day upon request. 16.3 The Secretary shall compile and distribute to the public a directory of individuals and organizations who have been issued credentials under Rule 16.1 to provide news coverage from the Senate floor. 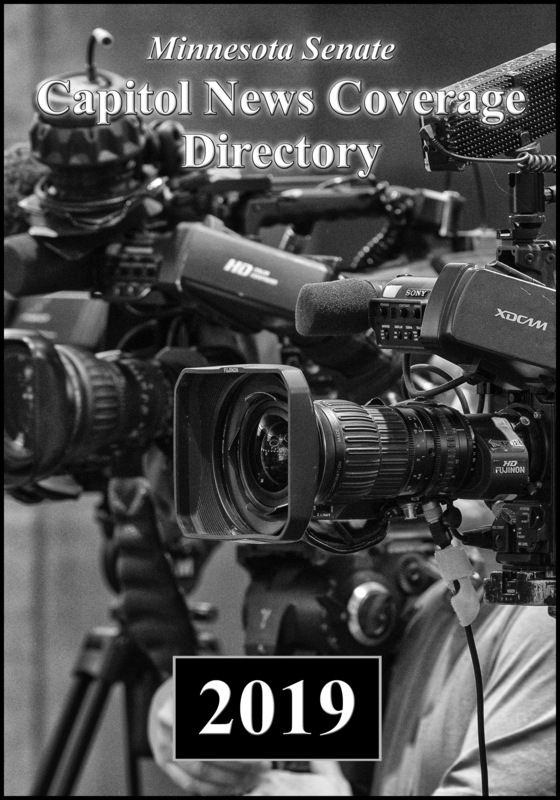 The directory must include each individual's picture and organization and a brief biography. 16.4 The Secretary must issue each individual or organization with credentials an identification badge showing the individual's name and organization. The individual must wear the badge when in the Senate Chamber. 16.5 (a) A credential shall be revoked by the Sergeant at Arms if the Sergeant has received credible information indicating that the individual or organization either was not qualified to receive the credential when it was given, or no longer qualifies for a credential. (b) An appeal of a revocation of credentials must be made in writing to the Secretary of the Senate, the Senate Majority Leader, and the Senate Minority Leader. The Committee on Rules and Administration shall review and decide the appeal within 14 days after receiving a letter of appeal. Education: BA, mass communications, Minnesota State University, Moorhead. Experience: Reporter, The Jamestown (N.D.) Sun, 1976 - 78; reporter, The Associated Press in Bismark, N.D., 1978 - 81 (statehouse reporter 1978 - 81); reporter, The Associated Press in Minneapolis, 1981 - present. Education: BA, print journalism and speech communications, University of St. Thomas. Experience: AP since 1999. Previously a copy editor at the Star Tribune, reporter at the Chippewa Herald (Chippewa Falls, Wis.) and news producer at WEAU-TV (Eau Claire, Wis.). Education: BA from the University of Minnesota in journalism and political science, 1982. Experience: Associated Press reporter since 1994; Conus Communications All News Channel, associate producer, 1994; Radio Free Europe/Radio Liberty in Munich, Germany, senior news editor, 1985 - 1994; United Press International in Washington, national desk editor, 1985, Minneapolis Bureau reporter, 1983 - 1985; Minnesota Daily, political reporter, 1979 - 1983. Experience: 43 years AP photographer. Education: Wm. Penn College (Oskaloosa, Iowa); Journalism degree, Drake University (Des Moines, Iowa). Experience: Covered Minnesota government and politics for Rochester Post-Bulletin and Forum News Service from 1998 through 2018. Now working part-time in retirement. Experience: Previously worked as a watchdog state government and politics reporter at the Sioux Falls Argus Leader and as a legislative reporter for The Associated Press in Madison, Wis.
Education: AA degree, Inver Hills Community College. Experience: MN House of Representatives, chief photographer, 1975 - 2011; Associated Press, freelance photographer, 1978 - 2018; freelance photographer, 2011 - 2018. Education: BS, journalism, University of Kansas. Experience: Reporter for KARE since 1997. Previously worked in TV news in Phoenix, Omaha and Lawrence, Kan.; and radio news in Kansas. Experience: 30 years of broadcasting and communications. Education: BA, Journalism and Political Science, University of St. Thomas; MA, Journalism and Mass Communications, Drake University. Experience: KAAL-TV, Austin, MN; WINK-TV, Fort Myers, FL; WHO-TV, Des Moines; KSTP-TV, Mpls-St. Paul. Education: BS, metorology with minors in geographic information systems and environmental studies, Northland College. Education: University of California-Irvine, majored in literary journalism and minored in business management. Experience: KTTC NewsCenter since December 2017; Interned at CNBC Business News, PBS SoCal, KMIR News/NBC and Voice of America in Washington, D.C.
Education: BA, Radio, TV and Film, University of North Texas. Minors in music and communication. Experience: Weekend anchor, producer and multimedia journalist at KTTC since August 2016. Nightly news anchor, producer and reporter at North Texas Television. Internship at WFAA in Forth Worth, Texas. Experience: Worked at KTTC since 1972, with more than 20 years as the senior news photojournalist. Education: Associates Degree Radio/TV Broadcasting; Bachelor's Degree Media Business. Experience: 20+ years in radio news and talk radio; KDLM news director, 1998-2001; MN Associated Press Broadcasters Board, past president; Political talk show host, KNSI St. Cloud, 2001-present. Education: University of Minnesota 2006-2010, BA degree in journalism, history. Experience: Mankato Free Press since September 2015. Previously worked at the Austin Daily Herald. Education: BA, Journalism, University of Wisconsin-Eau Claire. Experience: Most recently 12 years of freelance writing for dozens of local and national publications; held previous positions as reporter and editor with Washington Post Newsweek Interactive, McGraw-Hill, Landmark Communications, North Country Community Newspapers and Internet Broadcasting System. Education: BA, Political Science, Macalester College. Experience: Political correspondent, Minnesota News Network since 1993. Education: BA, Political Science/Journalism, University of Minnesota. Experience: Copy editor, Albuquerque Journal; legislative correspondent, Murphy McGinnis Media; legislative reporter, Associated Press, 1999 - 2016. Experience: Reporter with nine years experience at the Capitol for The Associated Press, Politics in Minnesota, MinnPost and Minnesota Public Radio. Education: BA, Gustavus Adolphus College. Experience: Minnesota Daily, St. Paul Pioneer Press. Education: BS, St. Cloud State University. Experience: Minnesota Public Radio, 1990-present. Experience: MinnPost; Associated Press in Olympia and Seattle; Everett Herald; Tacoma News Tribune. Experience: Reported on Washington State's Legislature for The (Tacoma) News Tribune and The Associated Press. Interned for The Seattle Times. Education: BA, Metropolitan State University (2005). Experience: Producer with MN Capitol News, podcast producer with Storymobile, producer at KFAI and WFNU radio. Education: BA, history, Metropolitan State University; MA, organizational leadership, Saint Catherine University (Exp 2019). Experience: Covering the Capitol for KFAI Radio News, Public Record Media, Capitol Conversations and mncapitolnews.com since 2008. Education: BA, English, University of Toledo. Experience: Rochester Post-Bulletin, 18 years as a political reporter, education reporter and feature writer. Winona Daily News, three years as education reporter. Experience: St. Paul Pioneer Press photographer: 20 years with the St. Paul Pioneer Press, 15 years in the newsroom. Education: Graduated from the University of Minnesota with a bachelor's degree in May 2018. Experience: Worked at the Pioneer Press since August. Past internships: Austin American-Statesman, Star Tribune, Pioneer Press, Rochester Post-Bulletin. Reporter and editor for two years at the Minnesota Daily, the University of Minnesota's student newspaper. Experience: Twenty years' experience; 11 years' experience with St. Paul Pioneer Press. Experience: St. Paul Pioneer Press photographer since 1983. Education: BA, History, University of MN, Morris. Experience: Reporter, Fairmont Sentinel, 1971-72; reporter, Rochester Post-Bulletin, 1972-77; reporter, St. Paul Pioneer press, 1977-present. Experience: Seattle Times, 1985-1987; St. Paul Pioneer Press photographer since 1987. Experience: 10 years s reporter at Pioneer Press. Education: B.A. University of Notre Dame; Fellowships: The Ohio State University, University of Michigan. Experience: The Seattle Times, Las Vegas Sun. Education: BA, History and American Studies, College of William and Mary; MS, Journalism, Northwestern University. Experience: Star Tribune (2014 - present); Previously: Omaha World-Herald, The Bulletin. Experience: Star Tribune, 2013-present; USA Today, 1987-2013. Education: California State University; University of Illinois, Champaign-Urbana. Experience: Editorial writer, Star Tribune; political editor, Star Tribune; political reporter; Star Tribune; Minneapolis City Hall reporter, Star Tribune; Cincinnati Enquirer, Roanoke Times and World News; Orange County Register; cities reporter, Los Angeles Times. Education: BA, journalism, University of Kansas. Experience: Star Tribune (2015 - present). Previously: Twin Cities Business; Lawrence (Kan.) Journal-World. Education: BS Photojournalism, Syracuse University. Experience: Wilkes-Barre, PA, Times Leader, 1981-83; Tampa Tribune, FL, 1983-86; Washington Times, DC, 1986-98, Star Tribune, 1998 - present. Education: BA, Coe College, Cedar Rapids, Iowa; graduate work, University of Minnesota. Experience: Star Tribune reporter, 1976-1986; assignment editor 1986-1992; editorial writer and columnist, 1992-2018; opinion contributor, 2019-present. Author and/or editor of 11 books, including "Her Honor: Rosalie Wahl and the Minnesota Women's Movement" and "The Pillsburys of Minnesota." Education: BA, journalism, University of Minnesota. Experience: Star Tribune (2014-present). Previously: Sarasota Herald-Tribune and the Post-Crescent. Education: BA, political science and print journalism, University of Southern California. Experience: Freelance journalist (The Washington Post, The Daily Beast, InStyle, Glamour, Public Radio International); politics editor and reporter, Refinery29; editor, NBC-owned TV stations national digital desk; political reporter, The Sacramento Bee. Education: BA, Journalism, University of MN. Experience: WMMR-AM news director, 1977-81; WCCO -TV producer, 1979-1982; KGBT-TV producer, 1982-84; KETV-TV producer 1984-87; KWTV TV producer, 1987-88; Conus Communication 1989-2002; cofounder and executive producer, The UpTake, 2006-present. Education: BA, Political Science, St. Catherine University, 2012; MA, Humanities, Prescott College, 2015; Ph.D., Sustainability Education (Journalism Focus), Prescott College, currently pursuing. Experience: Freelance reporting during the last several years on local politics and community mobilization efforts. Previous work as a reporter at the Minnesota State Capitol, reporting on both state and local elections, as well as legislative politics for independent, nonprofit organizations. Education: BS, Agriculture Sciences, University of Minnesota. Education: BA, Art, Creative Writing, Univ. of MN; Honor Program, 2001; Policy Fellow, Hurbert H. Humphrey Institute of Public Affairs, 2009 - 2010; Center for the Study of Politics and Governance. Experience: Commentator and essayist for TPT since 2007, Almanac and Nightly Business Report; covered Legislative sessions for Almanac At The Capitol, since 2007. Education: BA, Winona State University; major, Mass Communications, Broardcasting; minor, Speech Communications. Experience: Over 20 years of video production experience; 16 years with TPT. Worked four sessions with Senate Media in 1990's. Experience: WCCO-TV; Minnesota Public Radio.